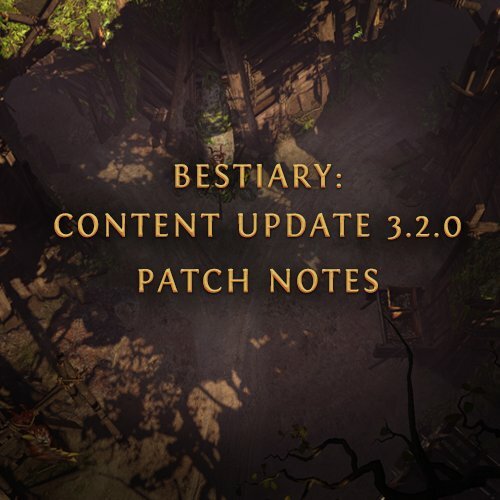 New beast content: Grinding Gear Games releases "Bestiary", the latest expansion of the popular monster hit Path of Exile. Since its first release in 2013, the New Zealand developer studio has been producing new content updates for Path of Exile at no charge. So also with the new Bestiary League Patch 3.2.0. The biggest feature of the latest expansion: players now get hunting lessons with the new NPC Einhar Frey. The hunter-gatherer explains how to tame the wildlife of Wraeclast. The world of Path of Exile is teeming with countless beasts that you can now capture. At the heart of it: the eponymous bestiary, a comprehensive book by Einhar Frey. If you catch a new beast during the adventures in Wraeclast, this automatically documents the bestiary. An attractive incentive to completely re-explore the big game world. But that's not all: Prisoner creatures can be kept in their own menagerie and displayed - until they are sacrificed for stronger equipment on the blood altar. Those who want to take it to the extreme can use the new Desert Spring map to open portals into the world of ghost beasts in order to capture even more valuable and rare pieces of equipment there. Grinding Gear Games also offers new material for endgame professionals: the Uber Elder waits for you in the middle of the atlas and is the heaviest opponent in the game so far. To survive this and other boss battles, the Ascendancy classes have been completely redesigned. How exactly - that's not what Grinding Gear Games has revealed. One thing is certain: The developers have revised and balanced all 19 classes. So also completely new builds should be possible. Also new here are three new gems. In addition to the passive skill Summon Phantasm on Kill, there are also two new active skills available: Spectral Shield Throw and Tectonic Strike. While the first skill hurls a copy of the shield that crashes on impact, the development studio is still overcast on the effects of "Tectonic Strike." You'll also get new gear, a new quest in Act 10, ten new prophecy cards, 30 new and very rare Fated items (which you can get from the prophecy of soothsayer Navali), and lots of changes not mentioned yet. When it comes to fresh content for the fan community, Grinding Gear Games once again puts it on its toes. At the start you can choose a league. The standard league is the norm. In addition, there are also leagues in which slightly changed rules of the game prevail. So there is an offshoot with faster monsters or a league in which the death of the hero means the final retirement from the race. In the new Bestiary Challenge League you can explore the new possibilities in Path of Exile on Friday evening. Let's start on Friday, March 2, 2018 at 9 pm. Then go the new version 3.2.0 including expansion and Bestiary Challenge League online. The complete patch notes can be found here(https://www.pathofexile.com/forum/view-thread/2093500/). Path of Exile is often considered a particularly fair free-to-play title. Everything is free of charge: download, create an account and gamble - there are no hidden costs or costs that are absolutely necessary for the progress of the game. Only for cosmetics and comfort items, such as more space in the inventory, players have to grab offline in the bag.